Hey look what I found. I don't know if this is just an old bottle, or if it has been labelled incorrectly. But the label say's 'charmed'. Now any serious Ulta3 polish gal knows that 'charmed' is the rather crappy green glitter polish. Well look at this. I think it must be an old colour not wrongly labelled, because I can't find a matching colour in the rest of the range. 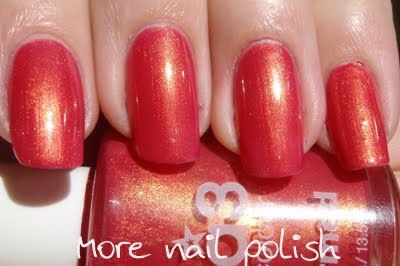 It's a coral pinky red with a fine gold shimmer. Me likey!! Anyone else found this little beauty?